So last Friday was my turn to do BBC Radio Leicester’s Food Friday piece with the fabulous Ben Jackson and what better way to kickstart my morning than cider and cheese. 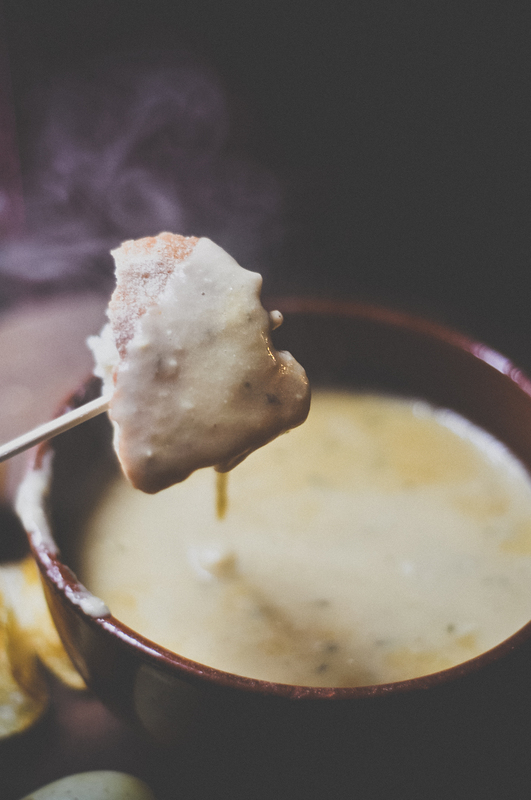 I was a *touch* hungover after an unexpected but very much welcome few glasses of wine the night before and as it turns out, cider cheese fondue is in fact a seriously good hangover cure! I always have a blast when Ben comes to visit, he is so passionate about food, cooking and particularly local food that we spend most of our time swapping food news, stories, new food finds/cookbooks we’ve found and basically just immersing ourselves in a month’s worth of goings on. Then I cook, we laugh, I usually add lots of booze to something and we eat, good times. Here we are making cider and cheese fondue (1hr40mins into the show) where I actually use the phrase: “Hey it’s Winter, lets get our booze on”, yeah thats me with a hangover, yeah I have no shame. Grate your cheese into a bowl, add the corn flour and mix well. Combine cider, thyme, garlic and lemon juice in a saucepan and bring to boil. When boiling reduce heat and add a handful of cheese. Stir in until its melted. Keep adding cheese one handful at a time, stirring constantly until all the cheese is used. Add your onion granules, nutmeg, black pepper, porcini mushroom powder and chilli flakes then stir in your calvados. Serve hot with chunks of crusty bread, boiled new potatoes, crisps, chunks of ham, chips, whatever takes your fancy! I read because of the “boozy goodness” caption. This recipe sounds really delicious!